Wichita's leading source for metal processing and finishing offering quick TAT and excellent quality. A professional commercial and residential excavation contractor, located in Augusta, KS, serving the Wichita area. Get your business on the fast track Cox Business Services. Providing quality electric signs and billboards to local, regional, and national companies. Harper Trucks manufactures hand trucks and material handling equipment in Wichita, KS. Located in El Dorado, we're a welding supply and repair store and distributor of medical and industrial gases. Wichita based medical transcription service with next day turn around and competative line rates. Full-service sign and graphics shop offering quality products, innovative design, and great value. Manufacturing traditional rubber, self-inking stamps and pre-inked stamps for Wichita and surrounding areas since 1967. Providing quality human resource solutions to the Wichita, KS community including job placement opportunities. Specializing in rental, sales, and service of traffic control devices for the State of Kansas and surrounding areas. 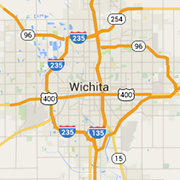 We can do full Wichita office cleanings several times a week, or just a small cleaning once per week. We are accommodating to your cleaning and scheduling needs. Offering the latest document management equipment with complete sales and service.